Clouds of tiny insects, rising and falling hypnotically along lake shores, contribute to the ambiance of warm summer evenings. My recent bike ride was interrupted by a lungful of this ambiance. If you find yourself in a similar predicament, you might wonder what these miniscule flies were doing before being swallowed, where they came from, whether they bite, and whether we need these interrupters of peaceful lakeside jaunts. We’ll get to these questions, but first, let me say that as an ecologist, I find these insects to be among the most fascinating and important freshwater invertebrates. Non-biting midges, also called chironomids, are most conspicuous when they hover in swarms near water. Not to be confused with the no-see-ems or biting midges maligned by Thoreau, they constitute a diverse family found on every continent. Two midge species are the only known insects in Antarctica. One Antarctic species lacks wings entirely and is therefore, I suppose, at little risk of death by human inhalation. Whether Earth-bound or in flight, mating is the reason for midge swarms. Newly emerged adults have a short time to find mates, and dense swarms function like singles bars. My clumsy encounter with a nuptial swarm did not make much of a dent in local midge numbers. They are abundant. They’re also hyper-diverse, with more species in this one true fly family than in all the families of stoneflies combined. Entomologists have described more than 5,000 species and are regularly called upon to come up with scientific names for newly discovered species. 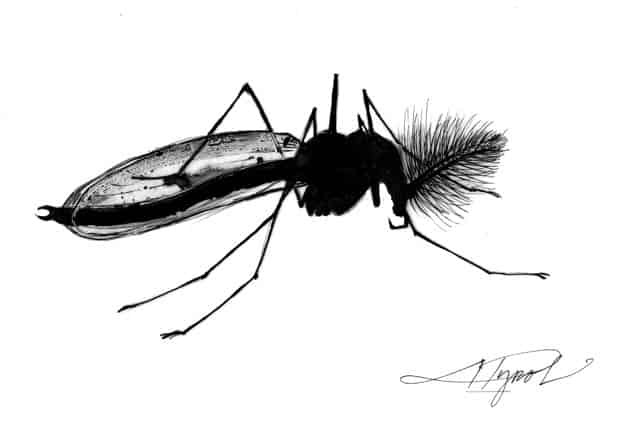 Dicrotendipes thanatogratus, a midge named for the Grateful Dead (thanatos is Greek for “dead” and gratus is “grateful” in Latin), is one example. With so many species, it’s not surprising that non-biting midges thrive in all sorts of habitats. Saint Michael’s College students and I have found them in every stream, pond, and lake we have sampled, and they often exceed 50 percent of the insects we capture. In ponds and deep river-silts, bright red midges called bloodworms use skin-bound hemoglobin to scavenge every trace of oxygen from their stagnant habitats. Dr. Richard Jacobsen studied a midge found only on the backs of mayflies; its life cycle synchronizes perfectly with that of its bigger host. Non-biting midges are also diverse in their culinary predilections. They eat nearly every conceivable foodstuff; they can be scavengers, herbivores, predators, or parasites. One species, Metriocnemus knabi, feeds exclusively on insect parts in pitcher plants in northern bogs. There are abundant midges grazing algae in salt marshes, consuming leafy detritus in tree holes, and they may well be scavenging from the rain water in the gutters of your house. These insects are essential in the aquatic food webs that support fish populations, and anglers seek to replicate their delicate forms to lure their catch. Like many insects, midges grow through a series of larval stages. Slim, legless, translucent larvae hatch from eggs laid in gelatinous masses. They grow quickly and become too big for their exoskeletons. These split, revealing softer exoskeletons that stretch and harden around their bodies. In streams, where I do much of my research, discarded exoskeletons accumulate behind rocks and logs. Sieving exoskeletons from stream froth is a little like panning for gold. Much information can be coaxed from these discarded shells. Cleaner streams host more midge species and certain species are never found in polluted streams. After four rounds of growing and shedding, non-biting midges enter a pupal stage. They may appear somewhat static, but each pupa is a hive of cellular activity. Cells migrate and rearrange, forming compound eyes, six legs, and in most species, a pair of wings. After a few days, the pupae split and adults emerge. Some midges hatch only at certain times of day and the rhythm of a stream can be followed by sampling drifting pupal skins through the day. The clouds of adult flies are a food source that moves from aquatic to terrestrial food webs, sustaining the swallows and bats that keep real pests in check. Non-biting midge swarms will persist as long as the weather is warm enough for fly muscles to flap fly wings. Some species hatch early in the season, some later. There are species that hatch once per year; others can produce two or more generations in a season. So when you find yourself in a swarm of insects this September, try to appreciate the romance. Perhaps the knowledge that fly love is in the air will make up for the occasional fly in your eye. Or in your mouth. Or snuffed right up your nose! Declan McCabe teaches biology at Saint Michael’s College. His work with student researchers on insect communities in the Champlain Basin is funded by Vermont EPSCoR’s Grant NSF EPS Award #1556770 from the National Science Foundation. The illustration for this column was drawn by Adelaide Tyrol. The Outside Story is assigned and edited by Northern Woodlands magazine and sponsored by the Wellborn Ecology Fund of New Hampshire Charitable Foundation: wellborn@nhcf.org.